The Democrats bet a lot of currency on Russian collusion. And we’ve all seen how that’s worked out for them. Instead of impeaching President Trump and members of his family, the Democrats find themselves caught in the vortex of their lies and deceit. Special Prosecutor Robert Mueller now spends more time investigating the FBI than he investigates Trump or his satellites. Anybody mentioning Don Jr or Jared Kushner? All of sane America knows neither candidate-Trump nor President Trump colluded with the Russians. 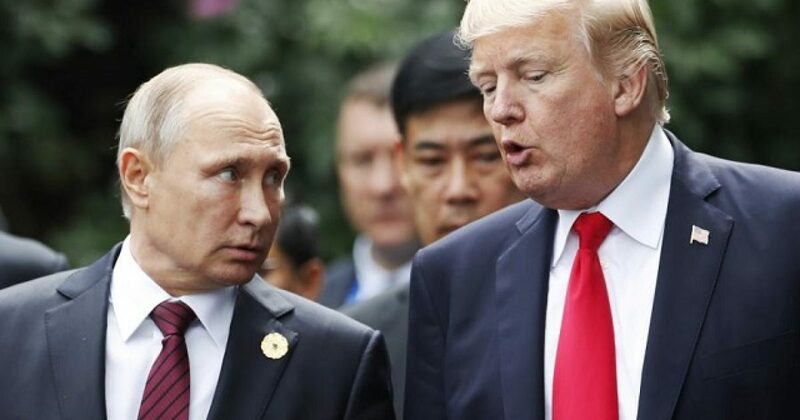 Democrats told us that Trump was a puppet of Putin, thus the collusion. Remember what Trump said of Putin and Ukraine? How could Donald Trump be so bold? Back in October the State Department warned that anyone in the United States or elsewhere doing significant business with 39 Russian companies and government organizations tied to the defense and intelligence sectors could be hit with sanctions starting early next year. The list was in response to the sanctions President Trump signed earlier in August. The move punished Moscow for its actions in Ukraine, while offering Leftist Democrats the bone of punishing Russia for its supposed interference in the 2016 election. This move was more than symbolic, like Obama’s closing Russian diplomatic offices and expelling Russian diplomats. President Trump’s move hit the Russians where it really hurts: their economy. Russia’s top banker says potentially far-ranging new US sanctions would “make the cold war look like child’s play” if implemented early next year. Herman Gref, chief executive of Sberbank, told the Financial Times that possible US sanctions against oligarchs and state-owned corporations would be “irrational” if they went as far as excluding state banks from the Swift payment system. And now we get to President Trump’s latest move. Let’s see how the Left spins this development. Trump arming the enemy of the Russians. I’m not foreign policy expert, but I don’t think a “puppet” would sell military hardware to the enemy of his puppet-master. I know the Left struggles with a leader who states his policies, and then follows through. After all, they watched Obama for 8 years, a real distortion of what leaderships looks like. For the Leftists reading this, let me help you out. There will be no impeachment of President Trump. Because Trump has been completely consistent in what he would do to manage Russia. And what a strategy. Putin may soon find himself embroiled in war in Ukraine and elsewhere. The Russian economy can’t handle war. The country is roughly 2.2 percent of the world GDP. To put this in perspective, the US budget is three times the size of the entire Russian economy. And you can bet President Trump will shrink the budget, while expanding America’s GDP. But consider how Russia flourished during the Bush and Obama Eras. In 2009 the Russian economy dipped to -11.2 percent, but then quickly ramped up during the Era of Obama to 5 percent. However, global factors related to oil, as well as U.S. sanctions for Russia’s role in the crisis in Ukraine started a contraction in 2014. If Russia were to play ball with the U.S., they would see their economy building again. And not because of a weak U.S. economy like the growth Russia experienced under Bush and Obama. Unless Russia cooperates with the United States, I predict their economy will take an even more significant hit than it did in 2009. Further, Russia’s deeper problem lies in its untrained and shrinking workforce. Russia ranks 9th in population with just over 142 million people. But their population has shrunk over the last decade. Russia simply isn’t replenishing its workforce fast enough. In short, you can bet that President Trump understands the economic issues driving Russia, ergo Putin’s motivations. While President Trump will work with Putin, he will not roll over. The Left will have a difficult time reconciling the demise of Russia during the Era of Trump. Russia’s fall will undoubtedly be a direct result of President Trump’s America First policy.